How a poker-playing lawyer crisscrossed the country in his pickup truck, searching for facts in a landmark lawsuit against Trinity Industries. 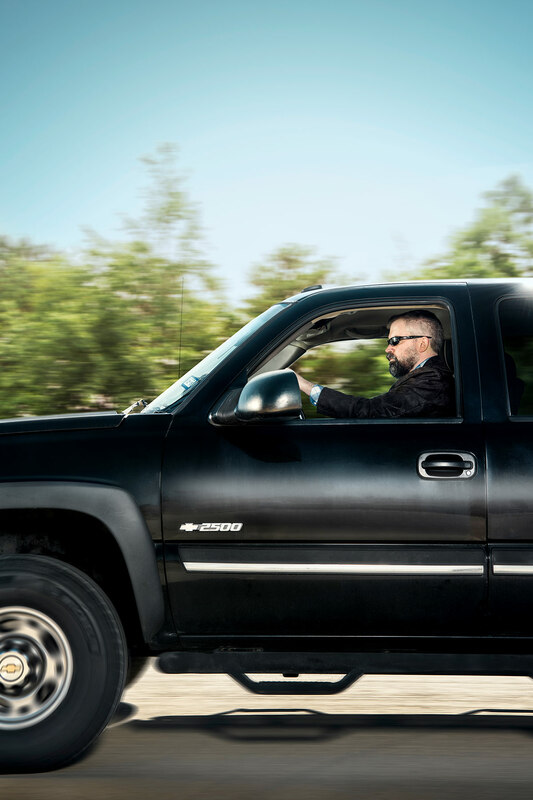 For Fort Worth attorney Steven Lawrence, the “saddle” in Gene Autry’s classic western song was the driver’s seat of a 2004 Chevy Silverado pickup which, in just two years, he drove more than 170,000 miles across about 30 states. Instead of a .44, Lawrence was armed with the modern lawyer’s weapons: a laptop, cellphone, and briefcase. 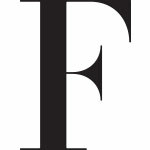 The attorney, who’s also a skilled poker player, took the marathon trip after making his biggest bet ever on what he calls “probably the case of a career.” He put all his chips on the table—and all his possessions in storage—after carefully studying a 2012 “whistleblower” lawsuit filed against industrial giant Trinity Industries Inc. Dallas-based, 85-year-old Trinity is widely known as one of the world’s largest diversified manufacturers of heavy metal products. Its subsidiary, Trinity Highway Products LLC, manufactures highway guardrails that are used along roads throughout the country. 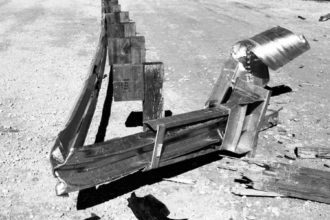 One of its products was called the ET Plus, a guardrail energy-absorbing “end treatment.” The rails are designed to take a direct hit and curve away from the vehicle. But something has to go on the end of the rail, because, without the end terminal, the rail can turn into something of a spear. 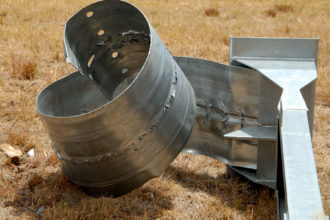 Test of Strength: Photos show a 2015 ‘crash test’ of the ET Plus end treatment by Southwest Research Institute in San Antonio. So now the fight was joined and, instead of signing a new lease for a posh apartment in Austin, where he’d been working for a Dallas law firm, Lawrence realized his real value to the case was deposing experts and talking to victims. All the arguments and legal moves against Trinity came to be considered qui tam actions, in legal parlance. That meant that this would be a whistleblower suit brought under the federal False Claims Act. Under the law, such suits can reward a private individual with part of a judgment or a penalty imposed by the court. 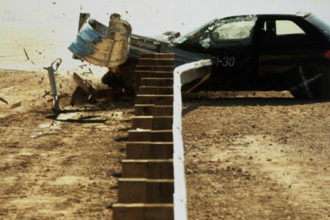 The whistleblower in this case was Joshua Harman, a Virginia business owner whose company installed Trinity guardrail systems along state highways. Basically, the whistleblower status meant that Lawrence’s client, Harman, would be standing in the government’s shoes, but without the government’s muscle or the legions of DOJ attorneys behind him. It was a classic tale of a whale—Trinity employed nearly 25,000 people, and its annual revenue at the time was more than $6 billion—pitted against a minnow. But no whale ever encountered anything quite like Steven Lawrence. Searching for Clues: Lawrence visited about 30 states on his fact-finding mission, often sleeping in his Chevy truck. Nearly a decade before, Lawrence, the only child of a traveling salesman and a school administrator and just two years out of law school, had lost his 55-year-old father to a stroke. The loss rocked and confused the young man, to whom much had seemed to come easy. He’d been valedictorian of his high school class, Phi Beta Kappa at Virginia Tech, and won a scholarship to the prestigious University of Virginia School of Law, which he eschewed to attend The University of Texas law school, also on a scholarship. After law school, Lawrence was hired to be a clerk for Walter D. Kelley Jr., a federal district judge in Virginia who eventually became Lawrence’s mentor. “From the first day, I knew he was extremely smart in figuring things out and cutting through the legal mumbo-jumbo,” Kelley says. But he admits at the same time that Lawrence, his first hire, was, well … a little different. After clerking for Kelley, Lawrence found himself working in Austin for the prominent, Dallas-based law firm McKool Smith in patent litigation. It was at that time that his father—who was also Steven’s “hero” and a long-time minister at a local jail—passed away. What was once robust now was empty. Losing that life anchor was tough. “The hardest thing I ever did was to listen to all the people talk to me about how my dad helped them,” Lawrence says. It wasn’t much easier carrying on at McKool Smith, but Lawrence had promised the firm that he would finish work on a large and complicated piece of litigation. “I told them that when it was over, I was taking some time off, and it would be for a good while,” he says. It was a time for introspection, an opportunity to look at who he really was and consider what he wanted to be. There are many ways to do this—to block out the rest of the world and focus. You can divorce daily vicissitudes by playing poker in Las Vegas for 18 months, say, or spend a year in self-reflective study on the side of a mountain in Thailand. By the time he returned to the states and dove into the Harmon case, Lawrence saw the lawsuit “not only as a good one, but a righteous one.” So he embarked on what can only be described as a crusade, climbing into his pickup and pushing across America. 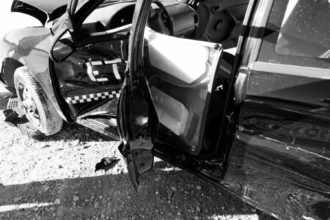 He took depositions, questioned experts, and probed the smallest guardrail bolts and nuts. It was a race against time. He learned to shower at the major truck stops, because they had “all the hot water, shampoo, and soap you need for just $12.” Some nights he slept at spots that he said looked like the Bates Motel. The trial would begin in Marshall, in East Texas, in July 2014, just three weeks after the DOJ stated that the government had no issues with Trinity, and less than a month after the Federal Highway Administration said the ET Plus would continue to qualify for federal funding. U.S. District Judge Rodney Gilstrap presided over what he eventually characterized as a carnival, “replete with errors, gamesmanship, and inappropriate conduct.” At the eleventh hour a mistrial was declared, a blow to Lawrence and his pocketbook, as he was now forced to re-prepare for another bare-knuckled trial. A retrial was set for 90 days later. By now 14 states had suspended new installations of the four-inch end terminals. Yet Trinity still seemed to be scoreboarding the Lawrence team—right up until the company’s writ of mandamus was rejected by the U.S. Court of Appeals for the Fifth Circuit. 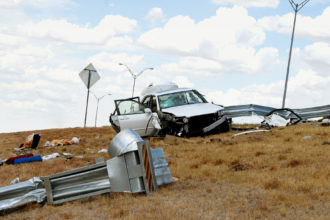 Scenes of Destruction: The photo at top left depicts the 2015 ‘crash test.’ The others show an actual 2011 fatal car crash in Wichita Falls that involved an ET Plus end treatment. Lawrence‘s primary role was to work with expert witnesses and prepare exhibits and presentations, often working into the early-morning hours poring over evidence and other exhibits proposed for trial the next day. This time, after five days, the jury returned with a verdict against Trinity. And after Judge Gilstrap was finished doing his treble damages and other math, the awards came to more than $680 million—the biggest in the 155-year history of the False Claims Act. 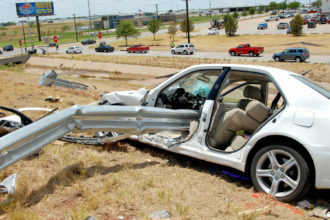 In effect, the jury found that Trinity had failed to inform federal officials that it had modified its guardrail system, while it continued to promote the product as approved by the Federal Highway Administration. Many thought the huge sum was just the beginning of Trinity’s woes. Personal-injury lawyers now had a playbook. Lawrence and his former mentor Kelley, who’d left the bench by then to practice law, decided to work together to represent the victims of the “defective” guardrails. No matter what the courts ultimately decide, Lawrence and Kelley feel positive, because they’re responsible for at least one important outcome: end-terminal products that don’t meet more up-to-date criteria, including the ET Plus, will no longer be funded by the feds. Lawrence, who’s now 39, continues to work on the product liability cases. And, going forward, he insists he would once again put his chips all in “to make a difference,” and he hopes another major project will come along for him to “put my heart and energy into.” But would he be prepared to go whole-hog: rev up the old Chevy truck and shower at the Flying J again? Because then, he’d be back in the saddle again.